A Seoul appellate court on Wednesday upheld another compensation claim by an elderly South Korean victim of Japan's wartime forced labor, ordering Nachi-Fujikoshi Corp. to pay her 100 million won ($88,754). 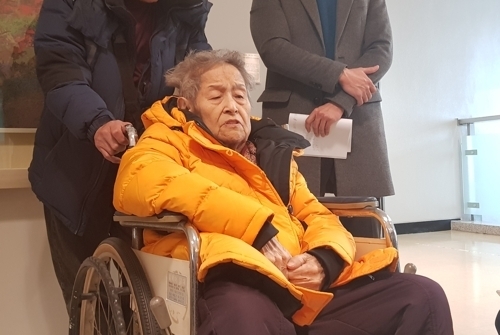 The appeals division of the Seoul Central District Court made the ruling in favor of Lee Choon-myeon, 88, who filed litigation accusing the Japanese company of forcing her to toil without pay in poor working conditions during World War II. Wednesday's court ruling adds to the series of recent court decisions made in favor of Korean forced labor victims. Last week, the same court reached a similar ruling for 27 surviving victims and families of those who had worked at a Fujikoshi factory in the mid-1940s. South Korea's Supreme Court made two landmark rulings late last year in favor of dozens of victims who had worked for Nippon Steel & Sumitomo Metal Corp. and Mitsubishi Heavy Industries Ltd.